What kind of courage do you need to tell your dad at the age of 16 that you are planning to quit high school? Moreover, wouldn‘t it be a lot harder if your dad is an immigrant from India who came to the U.S. with only $25 in order to pursue a better life through education and a traditional nine-to-five lifestyle? 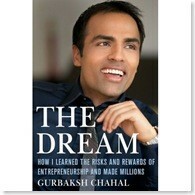 Gurbaksh Chahal gathered that courage and asked his parents’ permission to quit school when he was 16. His dad was nice enough to patiently listen what he had to say, but still was not convinced. He asked this kid to show him some proof. He had no idea what this kid was doing in his room on the computer day and night. Once Gurbaksh showed his parents his bank account, their eyes were about to pop out in disbelief, and they thought their boy was going to jail. They started to panic. Who wouldn’t? Especially an Indian parent, to whom saving $100,000 cash would be unimaginable over a lifetime. And here this 16-year-old kid is sitting on that kind of cash. Gurbaksh assured them that this was not stolen money and he made it from his Internet entrepreneurship. His dad eventually calmed down after listening to his explanation and gave him a one year break from going to school. Gurbaksh was 16 at that time. Guess what happened after one year? His Internet venture went so well that he was able to make $40 million in two years. So here is this 18-year-old kid who made $40 by selling his first online company ClickAgents for $40 million. Gurbaksh, or G, is now 26 years of age and last year he sold his second company BlueLithium to Yahoo for $300 million. G’s current project is gWallet – a site that allows users to find great deals. G will be featured on the new TV show The Secret Millionaire, due out in December 2008. He has also appeared on The Oprah Winfrey Show, FOX Business Network, The New York Times, The San Francisco Chronicle, Entrepreneur magazine, and many more. G is currently venturing into a few other TV shows. G’s recently published book The Dream advises entrepreneurs to dream big, embrace risks, and go after new niches. According to Chahal, failure is not an option. I had a glance at The Dream and I liked it after reading the first few pages. I hope to review it for ADJ readers in the future. The success story of G shows us how you can overcome any barriers and succeed. All you need is a dream, perseverance, and a belief in yourself. Can’t Afford To Buy Physical Real Estate? Buy Internet Real Estate!